Cystic fibrosis (CF) is a genetic disease that causes production of thick mucus in certain organs throughout the body, most commonly the lungs and pancreas. As mucus build-up increases in the lungs, breathing can become difficult; the mucus can also block ducts (pipes) of the pancreas and stop natural enzymes from reaching the intestines to help the body break down and absorb the nutrients in food. All children and adults need to be aware of what they eat whether they have been diagnosed with a disease that affects the digestive system or not. For people diagnosed with CF, not only do they need to make the right meal choices, but they also need to pay attention to the quality and quantity of food they eat and how frequently they eat. The Cystic Fibrosis Foundation (CFF) recommends adjusting dietary needs according to age and overall weight and growth. 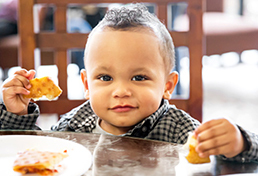 It is important at all ages that parents are sensitive to their child’s eating behavior and food intake, from infancy through toddler years, childhood, and adolescence. During these stages, dietary choices and habits can affect the rest of the child’s life. How Does CF Affect Nutrition? To get enough calories to promote normal weight gain and growth, individuals with CF may need to consume up to two times as many calories as a person without the disease. Also, to be sure that the correct amounts of vitamins are available, a multivitamin designed for people who have CF is usually prescribed. Even though people who have CF need extra calories, this does not mean people with CF can eat foods like french fries covered in cheese as their only food at every meal! They need to balance food intake at meals and snacks to stay on track with weight gain, growth and overall healthy nutrition.